Globe Telecom, through its wholly-owned subsidiary G-Xchange, Inc. (GXI), the operator of GCash, takes mobile commerce to a whole new level by introducing an innovative solution that transforms mobile phones into point-of-sale (POS) card terminals that accept debit and credit card payments. Powered by GXI’s safe and secure platform, Globe Charge harnesses the integration of a smartphone and an innovative mobile card reader into a mobile point-of-sale (POS) unit, empowering small and medium businesses (SMBs) with a convenient payment device and eliminating the need for traditional and more expensive card terminals. Globe Charge is available through Globe myBusiness sales representatives and at Globe Stores in most SM Malls in Metro Manila, The Globe Tower in Bonifacio Global City, Greenhills, Glorietta, and Trinoma. SMB owners can get the Globe Charge mobile card reader for free at Plan 999, which comes with a Samsung Galaxy Win, surfing-texting-calling combos, plus consumables. 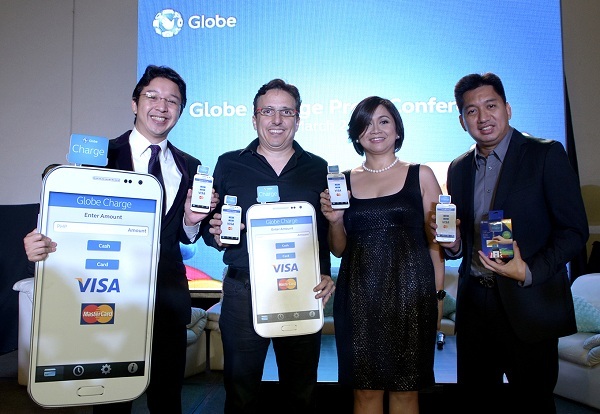 Shown in photo during the launch of Globe Charge are (from left) TV personality and entrepreneur RJ Ledesma, Globe Chief Operating Advisor Peter Bithos, Globe Senior Vice President for myBusiness Martha Sazon and GXI President Paolo Baltao.